Is Poor Pricing Practice Dragging Down Your Sales? Pricing practice is a discipline that crosses the boundary between sales and marketing. Salespeople are at a huge disadvantage when it comes to price negotiations because corporate Procurement departments have more tools and information. According to the latest data from Gartner, companies spent $3 billion on eProcurement software, and only $200M on intelligent pricing and quoting solutions. When it comes to price negotiations, is it any surprise who often wins the battle? When your sales team negotiates, which one are they? Q: ‘A’ player sales reps know their customers well and know how to negotiate to get the best price. How does a focus on pricing intelligence help them? A: Procurement spends much more on information and technology to prepare for negotiations than sales often does. Good pricing intelligence helps level the playing field. With so much information out there about both your company’s pricing and your competitor’s pricing – in addition to increasingly volatile market conditions that force constant updates to pricing – being agile and accurate with pricing requires more today than just experience and gut feel. Sales reps must harness the collective pricing intelligence of the organization to bring power to the negotiating table. When pricing is done well it allows companies to execute strategies by a variety of methods – product, geography, market segment, and so on. The chart below shows a company that had seven (7) regions and was able to drive growth across all of their regions based on improved pricing made available to field reps.
Q: What are the most common pricing challenges sales organizations face? A: In many organizations, the quoting process is broken. If you are a salesperson, how many times have you submitted a quote and waited for countless rounds of internal price negotiations before you receive an answer for your customer? Everyone weighs in: Your sales manager wants to know if we’ll win the deal if the price is approved; the product manager wants to know why we continue to discount so heavily; the engineering team offers a suggestion about a product that is a better fit. When it comes to pricing, everyone wants a voice. And salespeople often feel that the price they get back is unrealistic given the competitive environment. You lose the deal while navigating the sea of opinions. Salespeople need better tools. We see customer reduce the amount of time it takes to respond to RFPs, sometimes in half, after implementing pricing software. Plus, they win at higher price points. When customers feel like you are more responsive during the sales engagement, they positive perceptions about your company and your ability to deliver, reducing risk for them in selecting you. Salespeople trust the guidance they receive and are more confident during negotiations. Sales organizations who use pricing software see it as an revenue engine indispensable to their growth. Q: What are some of the best practices that sales managers can use drive sales and profit growth through a focus on pricing? A: We’ve seen organizations conduct monthly sales contests where each sales leader competes against his peers to see who drives the greatest month over month improvement in margin. We find that contests like this harness the natural competitiveness of salespeople. By providing tools that allow managers insight into who is pricing well and who is not, sales leaders will leverage best practices for negotiating across their groups and spur their teams to higher levels of pricing and negotiating performance. Q: Increasing price transparency is a big topic. As a company’s pricing becomes more transparent, how do companies continue to differentiate pricing across customers? A: Pricing transparency is only an issue when your pricing practices aren’t defensible. Most companies have such a broad range of pricing that it would appear the driver was asleep at the wheel when pricing is approved. By providing an understanding of how customer groups value your products – and as a result how you should price them – you can establish a defensible pricing strategy. If and when your pricing ever becomes transparent, you’ll continue to have a strong negotiating position. Q: In an organization, is it possible to really determine who prices well and who does not since every salesperson’s territory is unique? A: Absolutely. Good pricing uses a customer-centric segmentation as its foundation. Customers must be bucketed into peer groups based on key buying criteria to normalize the effects of customer differences such as product mix. By providing a range of acceptable pricing levels – such as floor, target and expert pricing for each customer and product – sales leaders have the critical information they require. With this, they can see who is too often quoting under the target price, and who is getting great pricing at or above the expert price level. Good sales performance management with regards to pricing takes away all of the excuses of why ‘C’ salespeople can’t get the price that the ‘A” salespeople do. Is my field sales force setting and holding prices? Do I have margin bleeding through my sales team? How confident is my sales force with the pricing coming out of my tools today? Have I given my sales reps the tools they need to price effectively within the timeframe the customer needs? Will I be able to compete effectively without more agile sales intelligence solutions? If the answers to these questions are not favorable, consider improving your sales performance management system to incorporate automated pricing through a revenue management tool. 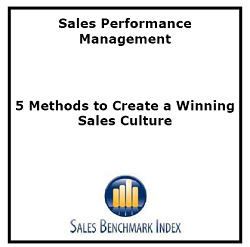 Author: Mike Drapeau Download our latest Sales Performance Management whitepaper on 5 Methods to Create a Winning Sales Culture.